Latitude: -45.348199. Longitude: 170.827305. 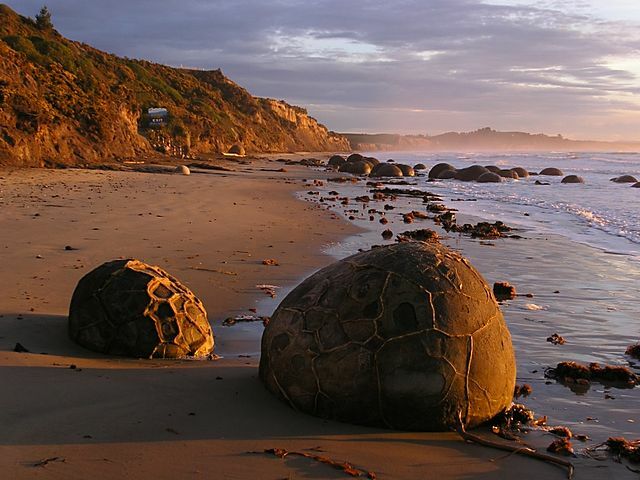 Strewn along the Moeraki beach, Koekohe Beach and Shag Point, in the Otago region, at the far south-eastern side of South Island, New Zealand, are many strange oval and spherical-shaped boulders – resembling, perhaps, giant potatoes – indeed the very name ‘Moeraki’ means “potatoes” in the Maori language of New Zealand. There is an interesting legend, to say the least, which attests to this strange curiosity. Many of these boulders are often half submerged in the sand and bed-rock, but when the tide comes in they mysteriously disappear, obviously, (or do they) and, after the tide goes back out they are seen to be not submerged ie ‘completely whole’ or fully uncovered of sand. These large boulders probably date back 60-65 million years. They are located in the south-eastern part of the South Island, in New Zealand, some 35 km (22 miles) south of Oamaru, between Moeraki and Hampden, and 80 km (67 miles) north of Dunedin. Access to the boulders is from highway 1 (Hampden-Palmerston road), just half a mile south of Hampden town, to the Moeraki Boulders Visitor Centre and car-park. These curious grey boulders are literally strewn along the beach, often in clusters, and some in smaller groups of two or so. They vary in size but generally they are somewhere between 1 foot 7 inches and 7 foot 2 inches in circumference and in height between 2-8 feet; some are damaged and broken up due to constant erosion from the pounding waves, many others are wonderfully smooth-shaped and ‘naturally patterned’ with unusual circular, diamond and oblong shapes, said to be somewhat similar to ‘the eyes in potatoes’, but with connecting lines. The boulders are made of hardened mud, silt and clay, and they are cemented together with calcite which is often quite weak at the core and hard at the outer rim, which might account for some of the boulders cracking apart! 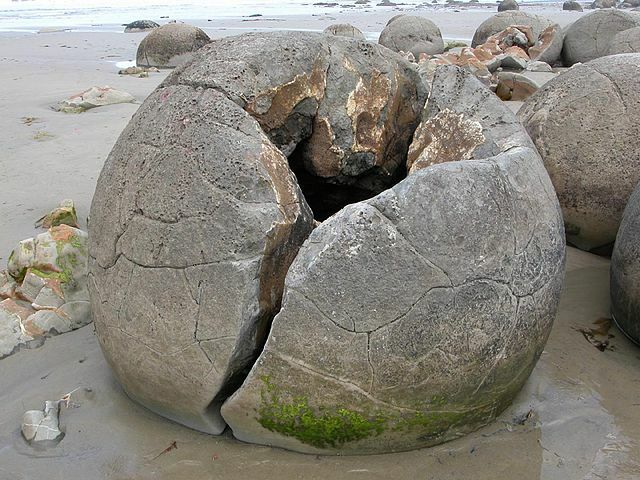 Seamus P. Cahill writing in ‘Ireland’s Own’ magazine says that these “Huge stones appear on the sand at Otago, New Zealand, and then disappear – only to be replaced mysteriously by new ones!”. In the colourful and informative book ‘The Beauty of New Zealand’ by Errol Brathwaite we are informed that: “Moeraki Beach is named after the potato which ancient Polynesian voyagers brought with them in their double-hulled, ocean-going canoe. The canoe, so the olden legend goes, capsized near Shag Point, at the end of the beach, and the moeraki potatoes and some gourds which she was carrying were strewn by the tide along the beach, and were later transformed into boulders. Today, these septarian stones lie half buried in sand, a geological oddity, rusty-red or yellow inside, with crystalline cores”. But we know that in geological terms they date back 60-65 million years and apparently lay on the sea bottom for much of that time, until the sea-levels began to fall some 15 million years ago. But the fact that “they” disappear and then reappear is simply an over-active (vivid) imagination from more recent times. The boulders are now something of a tourist attraction, and visitors (and geologists!) come here from all over the world to see these strange and curious rock formations. The boulders are sometimes called Araiteuru after the legendary Polynesian voyager sailing canoe which was said to have brought them here hundreds of years ago when they were apparently, and with much imagination – large potatoes! It is recorded that the Araiteuru also carried a cargo of calabashes, barracudas and eel baskets, and so I am minded to say that it must have been a very, very large canoe to carry such a large amount of items! Brathwaite, Errol., The Beauty of New Zealand, Golden Press Pty Ltd., Avondale, Auckland, New Zealand, 1982. Cahill, Seamus P., (Just Imagine), Island’s Own, Wexford, Ireland, (various dates). Categories: Glacial Erratics, Misc Subjects, Natural Stone Or Other | Tags: The Moeraki Boulders at Hampden in New Zealand, The Mysterious Disappearing Boulders at Moeraki on South Island New Zealand | Permalink.